There are some voices you recognise as soon as you hear them - and this week in 1992, a British female singer with an unmistakable tone made her debut on the ARIA top 50. Yep, I'm talking about Des'ree. Des'ree's first single hit the chart. In the video she did some art. Her voice really stands apart. Ooh I get the shivers. Her first single wasn't the biggest of hits, but for those of us who enjoyed it - I bought the cassingle! - it was just a taste of her soulful sound. More successful singles would follow in the years to come. The most successful single in Australia this week in 1992 was "Love You Right" by Euphoria, which became the first homegrown chart-topper since Melissa's "Read My Lips". It would be the first of two weeks at number 1 for the dance track. I actually think this was one of the best singles from Rise - even, dare I say it, better than "The Horses". But, it was the fifth single from 1991's top-selling album, so no one could've been expecting too much. This was also the fifth single from an album that'd done pretty well on the chart, but in this case, "Take You Higher" probably deserved to become Noiseworks' worst performing single ever. This Eurodance track couldn't be more 1992 if it tried. Based around the hook from "Respect" and featuring a typically early '90s rap, "R.E.S.P.E.C.T." came from Italo house artist Ubaldo Zambelli. Number 66 "Colour Of Love" by Snap! They really should've gone with "Rhythm Is A Dancer" instead of this unusually downbeat song, shouldn't they? "Colour Of Love" was the lead single from Snap! 's second album, The Madman's Return. After two uptempo pop/rock tunes, it made sense to lift a ballad as the next single from String Of Pearls - and it was another song with a perfectly crafted chorus from Ms Conway. Although it might seem like "Release Me" wasn't successful, it did spur people on to buy the album instead, with String Of Pearls re-entering the top 50 in a week and progressing into the top 20 for the first time. Although, perhaps the fact that Deborah won the ARIA Award for Best Female Artist in early March also had a little something to do with that. The music career of the singer born Desirée Weeks got off to a flying start. She was snapped up by Sony Music on the strength of a demo and released one of its tracks, "Feel So High", in the UK just 12 weeks later in August 1991. Things came to a crashing halt as the single stiffed at number 51 there. Her label tried again in early 1992 and, complete with a new video, the soulful ballad became a top 20 hit. Simply Red were an unstoppable chart force in the UK at this point in their career, racking up four top 20 hits from Stars, which topped the British albums chart for 12 weeks, and was the year-end number 1 album for both 1991 and 1992. "Stars" was the biggest hit of all, reaching number 8 in the UK, while in Australia, it peaked just inside the top 30 at exactly the same position as previous single "Something Got Me Started". As with Deborah Conway's single, the easy listening track did push its parent album back up the ARIA albums chart, with Stars returning to the top 10 and reaching a new high of number 7. Achieving what they hadn't been able to do with "Try A Little Tenderness", film band The Commitments breached the top 50 with "Mustang Sally". Made famous by Wilson Pickett in 1966 (a year after it was first released by Sir Mack Rice), the R&B song is one I'd happily never hear again thanks to it being inescapable in the wake of the film's success. 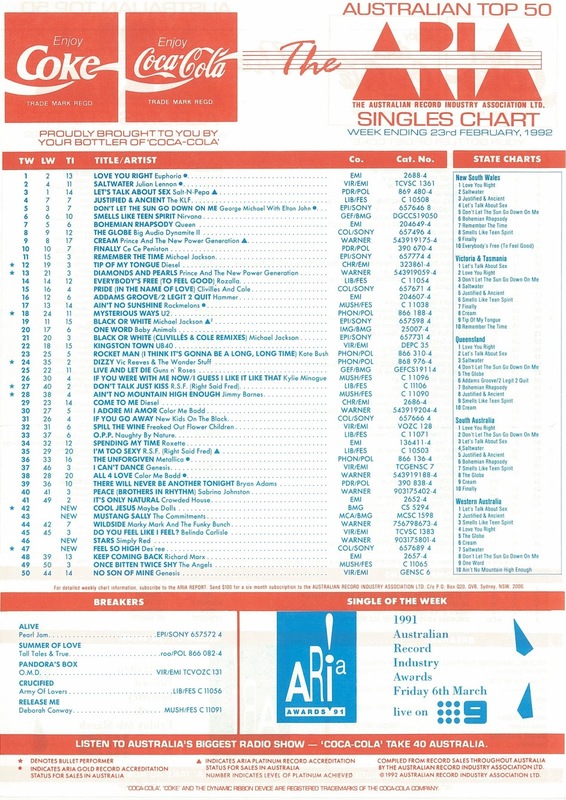 Although it wasn't a big chart hit in its own right, it was another case of a single being responsible for a lot of people buying the album, on which it was the first track. This week, the soundtrack spent its 20th week inside the top 10, while next week, a second volume would join it in the top 20. Nothing if not consistent, Maybe Dolls peaked just one place higher with their second chart hit than they had with their far superior debut single, "Nervous Kid". Featuring E Street's Marcus Graham and future Red Dog star Loene Carmen in the music video, the song set up the band's debut album, Propaganda, which debuted in mid-March. Two more singles were lifted from the album, but neither "Never Look Back" nor "Only Love" reached the top 100, and that was pretty much that for Maybe Dolls. Next week: the arrival of two game-changing acts - one, a hot new grunge band and the other, a techno duo that ushered in a new era of Eurodance. Plus, a chart-topping song from 1970 finally provides a British band with the hit that'd eluded them for so long. I don't remember 'Nothing To Lose', 'R.E.S.P.E.C.T.' or 'Take Me Higher'; though the latter is a cover of Sly & The Family Stone's 'I Want To Take You Higher'. 'Colour of Love' was a strange lead single choice when 'Rhythm Is a Dancer' was an option; though I suspect it had something to do with in-house politics, as Turbo B wasn't on the original LP version of 'Rhythm...'. I would have heard 'Release Me' before but forgot how it went. 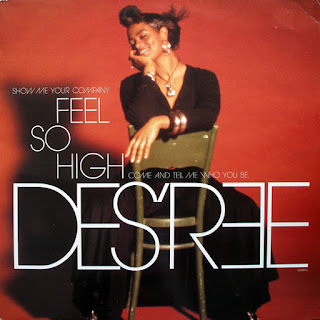 I liked the singles from Des'ree's first album, and 'You Gotta Be' too at first. But then she seemed to become an icon for the self-help book-reading, Oprah-watching demographic. 'Stars' was pleasant enough, if not too exciting. Fox FM in Melbourne were playing 'Mustang Sally' for what seemed like months before it entered the chart, and it became quite an irritating song for me.